Once a stain has been applied (or dripped) onto bisqueware, there is little you can really do to clean it off completely. This is because once the stain does soak down into the porous bisqueware, there is little you can really do to clean it off completely. Use a mechanical pencil. They keep a consistently thin line without having to stop and sharpen them. Don't be afraid to erase. Most bisqued surfaces allow you to erase fairly easily. Just either blow the eraser fragments off, or if need be use a soft brush to very gently brush them away. Tilt your surface to avoid elongating the image while you draw. In the photo you can see how the plate is propped up on layers of foam. The foam not only cushions the bisqueware, but also helps keep it from sliding down. Double-check your drawing before you begin applying any stains. Stand upp, go away for a few minutes, then look at the drawing fresh. Now is the time to correct any mistakes or to fine-tune the design. There is a small amount of red iron oxide (Fe3O2) with distilled water in a small plastic cup to create a stain. When using raw oxides like this, bear in mind that they will settle. This can work to your advantage, making it easier to keep from loading too much colorant into your brush. Brushes are an important determiner in what kind of line you will get. In the example, I am using a small sable brush (# 1 round) to draw lines with. For medium lines, I would suggest a #4 round, for thick, bold lines I would begin by trying out a #6 or #8 round. For thick-and-thin lines, try a flat brush instead. If you haven't worked with a certain brush or brush type before, try out different strokes using water on a piece of paper. 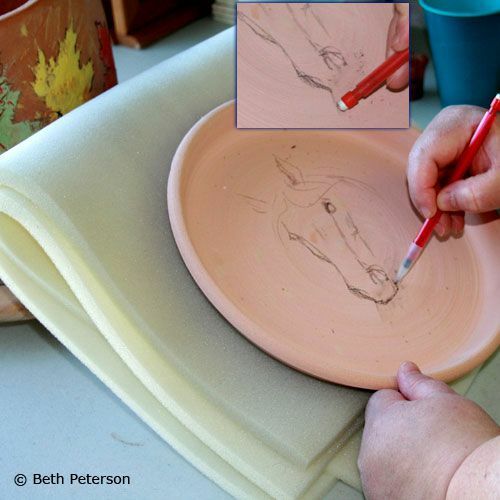 Remember that you only want the tip of the brush to be on the surface of the paper or bisqueware. The upper area of the brush's hair is the reservoir for the stain (or ink). Keep the plate tilted. Also, do not wet the plate before brushing on the stain. This ensures a clean stroke, with little to no fuzzing at the edges of the line. Ceramic stains can also be used as washes, not just for lines. This can help intensify the design, add visual interest, and yes, even help modify and disguise "mistakes" on stain line drawings. However, stain washes do not have to be done in conjunction with lines! Just as with brush and ink painting, you may want to work entirely with wash areas. Try using the varying intensity (and possibly color) of the ceramic stain washes to define the image or design. Using ceramic stains in this way is very similar to working with brush and ink and watercolors. Try out using a very wet brush on dry bisque for a wet-on-dry effect. For a damp-on-damp fuzziness, dampen the bisqueware before applying the stain. Use more (distilled) water than for line work. Thin layers can be built up to increase the ceramic stain's density. If an area gets too much stain, use a wet toothbrush to scrub the area and move some of the stain. Do not worry if some of the graphite mixes in with the stain. It will burn out. Ceramic stains can be used to mimic the look and effects of the most wonderful brush and ink paintings. This, in fact, is the way in which the very famous blue-and-white Chinese porcelain pottery paintings and designs came into existence. Potters and pottery painters borrow techniques from their screen and scroll painting "cousins". There are two reasons why it is suggested to re-fire to bisque temperature before putting any glaze, including clear transparent glaze, over the design. Graphite Burnout: As you can see, all the pencil marks are completely gone with no marring of the piece. The graphite (carbon) can, however, cause a glaze to pit or blister if it is not burned off before glaze is applied to the piece. Sinter the Stain: The stain is also partially fused to the clay after re-firing. This makes it less likely to smear during glaze application, as well as helping keep the stain from lifting up into the glaze during the melt. Such lift into the glaze can cause fuzziness in the design or, in some case, the complete dispersal of the stain into the glaze during firing. What is the Best Way to Cut Clay Surfaces for Decoration on Pottery?